Don't Panic is a pretty easy game to get the hang of. Start the timer, pick up a card and shout out three of whatever the card asks for (for example: name three smelly things). Once you've named all three stop the timer and write down the number, that's visible on it, on your score sheet. The quicker you finish the more points you earn. Play then passes to the next person, and so on. When the next round starts you have to name four things. Then in the next round five things, and so on until you get to the final round where you must call out seven things. After the final round has ended, the player with the most points is the winner. While it doesn't sound difficult, it's surprising how your brain turns to jelly when the pressure is on. And, when it's not you under the spotlight, it's amazing how frustrating it is when you can name loads of items while your friends are wracking their brains like simpletons. This game can be enjoyed with the family, or to lighten up a party. To ensure that people of all ages (and intelligence) can play together there are five levels of difficulty on each card. So if Professor Stephen Hawkin should pop round for a game while Forrest Gump is round for tea, they can both be evenly matched. The presentation is also impressive. The timer also acts as the holder for the cards. And, once you've finished playing everything slots away easily into a plastic holder which ensures that the cards don't move around in the box and get damaged. 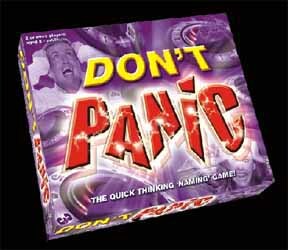 If you want a cool game for all the family to play - one that can be played over and over again without getting tiresome - Don't Panic is a worthy contender.